Summary: If you can dream it, this book will show you how to bring it to life in distinct and dramatic color. With easy-to-follow, step- by-step instructions, Drawing Fantastic Dragons teaches the tricks and techniques to create your own amazing art. Start with a sketch of the dragon’s body form. Then add the head, tail, arms and legs. Next customize it with one of the many styles of horns, scales, claws and wings detailed in this guide. You will even learn how to add age, personality and animal attributes to your dragon. 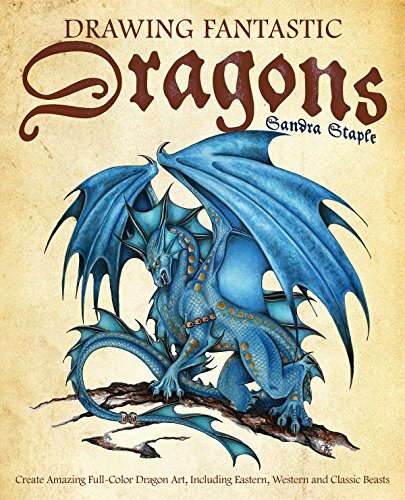 Lastly, author Sandra Staple shows how to finish your dragon drawing with amazing color effects. Packed with example after example, this hands-on guide features dragons of all shapes and sizes, and includes a special section on how to draw unique beasts like earth, air, and fire dragons, wyverns, hydras, and more. If you’ve ever wanted to learn to draw dragons, this is a great guide to help you out. The book is more than just pictures to look at. It’s filled with text with tips and hints and guides to what you need to know. You’ll find step by step sections to work on specific parts such as dragon eyes or wings. After you master the different parts of the dragon tackle the guided lessons on creating different types of dragons from the broad/stocky dragon to the long/lean dragon, to the cute dragon to specific styles like Eastern or Western. There is also a guide on creating a water dragon. The final section shows you how to add age or gender to your dragons and even how to create an undead dragon. You can create a bird or horse dragon, lizard or feline dragon. The book really covers all possibilities. Make sure you pick yourself up a sketch book and some pencils if you get this book as you’ll have lots to practice. 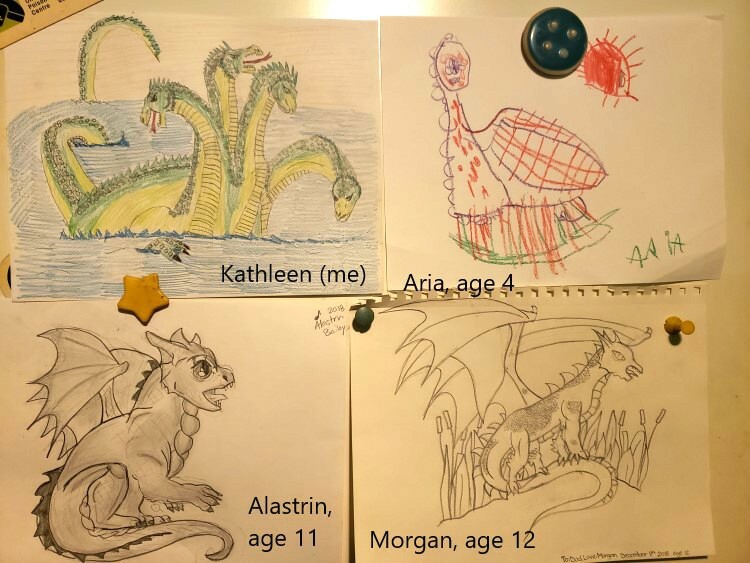 The kids and I used the book to draw dragons, here’s what we came up with. Buy Drawing Fantastic Dragons from Amazon.com and help support the blog.